What does it mean to align your life with the mission of God? What does that mean when you’re running a nonprofit? What does it look like when you’re retired from what looks to be a successful career? How does it weigh into a decision to reenter the workforce or find a new job? Is it too late to ask when you’re at the pinnacle of your career? This is a small taste of what some twenty Newbigin Fellows and their cohort leaders are asking as the new year gets started. Any one of us is capable of asking big questions. But when do we have time, and who can help us answer? One of the most important things that the Fellows are stepping into this year is a space being held for profound searching. We stepped into this space briefly at our opening retreat, as we heard that God’s plan for the restoration of the whole world might mean that our life with God is as communal and global as it is personal. Newbigin is not only a time for holding space together, it is a contemplative year in which Fellows receive tools with which to pry open space with God on their own. One week in and we are already learning spiritual practices like lectio divina to help open us up to hearing the voice of God and, more importantly, to being transformed into the image of God in Christ. In Eph. 3, Paul prays that the Ephesians might know God’s love in all its fullness: breadth, length, height, and depth. That’s four dimensions. My prayer for the Fellows this year is that they’ll start to see it: how God’s love extends over the length and breadth of the whole earth, that God’s deep love for us in our souls connects us with this world that God loves, sending us into its every corner to make that love known, and that this love also carries us up into God’s very presence, where Christ is seated at the Father’s right hand. 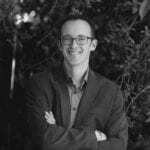 J.R. Daniel Kirk has been the Pastoral Director for the Newbigin Fellowship since July, 2016. This entry was posted in Articles, Newbigin Fellowship, Updates. Bookmark the permalink.